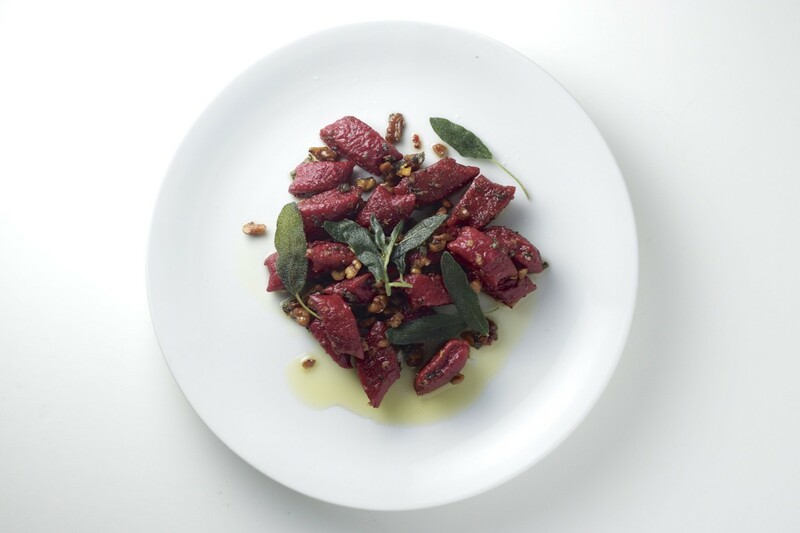 Vegan January has come and gone and though I have one more vegan post to make, I thought this beet gnocchi was a bit more fitting for the Valentine’s Day holiday (although a couple of days late!) I’m still perfecting my gnocchi-making technique, but I love the gorgeous color and hint of earthiness the beets bring to this recipe. You’ll likely have a bit of leftover beet puree with this, so I encourage you to make a Chocolate Beet Cake with the remainder. Preheat oven to 375 degrees. In a baking pan drizzle beets with olive oil and sprinkle with salt. Add 1/4 cup of water to the pan and cover tightly with aluminum foil. Roast in the oven for about 1 hour or until beets are soft. Remove and allow to cool. Once you’re able to handle them, use your hands to peel away the skins. Use a vegetable peeler if needed. Cut beets into cubes and puree in a food processor. In a standing mixer (which I don’t own – I used my Cuisinart with a plastic paddle and pulsed to control the speed), combine 1 1/2 cups of the beet puree with ricotta, romano, egg, nutmeg and 1 Tablespoon of salt on low/medium speed. Scrape the sides of the bowl and slowly sprinkle in the flour with the mixer on low/medium speed until it just comes together. On a lightly floured surface, knead the dough until smooth and a little sticky. Don’t over-knead – you want the dough to feel light. Cover the dough and let it sit at room temp for about a half hour. While the dough is sitting, melt the butter over low/medium heat. Bring melted butter to a golden brown color and remove from heat. Strain through cheese cloth to remove the solids. Set aside. In a saute pan, fry the whole sage leaves in a bit of olive oil until they crisp up. Remove and allow to cool on a paper towel. Bring salted water to a boil in a large pot. Prepare an ice bath and keep nearby. Divide the dough into 8-10 pieces and roll each one into 1/2 inch thick ropes. Cut each rope into 1/2 inch pieces. Boil in batches, letting the gnocchi simmer about 1 minute past when they float. Remove with a slotted spoon and put into ice bath to chill while you cook the remaining. Once you’ve finished with the gnocchi, saute the garlic in a bit of olive oil over low heat until fragrant. Add the brown butter and chopped fresh sage and stir for a minute or so. Stir in fresh lemon juice. Add gnocchi and combine until the gnocchi turns a rich red. Season well with salt and pepper. Toss in walnuts. Serve hot garnished with crispy sage leaves.